Universal Pictures Debut First Poster for Oliver Stone’s Crime-Thriller 'SAVAGES'! Universal Pictures have debuted the first official poster for Oliver Stone’s upcoming thiller Savages. The movie is based on Don Winslow’s best-selling crime novel of the same name. 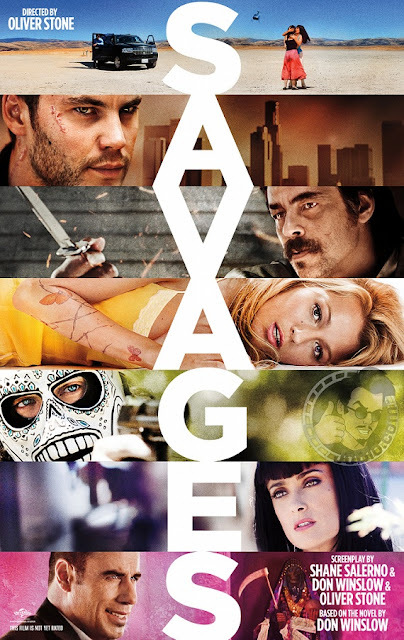 Savages stars Taylor Kitsch, Blake Lively, Aaron Johnson, John Travolta, Uma Thurman, Benicio Del Toro, Salma Hayek, Emile Hirsch & Demian Bichir. The movie sees Kitsch & Johnson play two Laguna Beach marijuana kingpins who encounter a world of trouble when their shared girlfriend [Lively] is kidnapped by a Mexican drug cartel. Savages arrives July 6th in the US & September 26th in the UK. Hit the jump for the details. 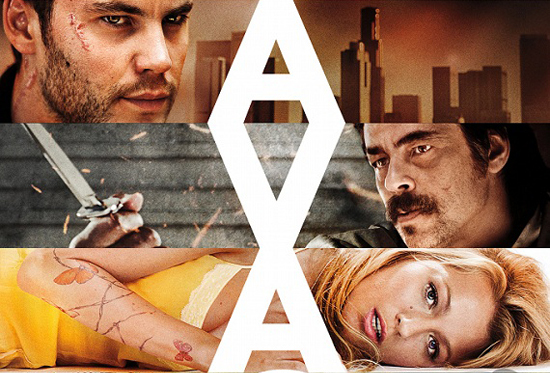 Synopsis: "Three-time Oscar®-winning filmmaker Oliver Stone returns to the screen with the ferocious thriller Savages, featuring the all-star ensemble cast of Taylor Kitsch, Blake Lively, Aaron Johnson, John Travolta, Uma Thurman, Benicio Del Toro, Salma Hayek, Emile Hirsch and Demian Bichir. The film is based on Don Winslow’s best-selling crime novel that was named one of The New York Times’ Top 10 Books of 2010. Laguna Beach entrepreneurs Ben (Johnson), a peaceful and charitable Buddhist, and his closest friend Chon (Kitsch), a former Navy SEAL and ex-mercenary, run a lucrative, homegrown industry—raising some of the best marijuana ever developed. They also share a one-of-a-kind love with the extraordinary beauty Ophelia (Lively). Life is idyllic in their Southern California town…until the Mexican Baja Cartel decides to move in and demands that the trio partners with them. When the merciless head of the BC, Elena (Hayek), and her brutal enforcer, Lado (Del Toro), underestimate the unbreakable bond among these three friends, Ben and Chon—with the reluctant, slippery assistance of a dirty DEA agent (Travolta)—wage a seemingly unwinnable war against the cartel. And so begins a series of increasingly vicious ploys and maneuvers in a high stakes, savage battle of wills." Images Via JoBlo & their f**king watermarking. I'm reading: Universal Pictures Debut First Poster for Oliver Stone’s Crime-Thriller 'SAVAGES'!Tweet this!